It’s a slippery slope. Building worry upon anxious worry, pebbles of worry stones pile one upon the other into a pyramid of lies. And I’m down there clawing like a helpless sheep at the bottom of a ravine, as each worthless attempt to rise above sends me sliding backward to the ground until I am paralyzed with fear. I am a notorious worrier dating back to childhood with a tendency to internalize and over-think and make clumsy attempts to fix problems. But all this energy amounts to wayward attempts at finding peace and balance. And you know what? All of the effort to try and work things out in my mind is exhausting and it paralyzes me, stops me dead in my tracks until it renders these useless feelings: I can’t be a mom today. I’m too tired to be a good wife. I have too much on my plate to be a friend. Until there is nothing left for me to do, and I’m on my back looking up. In all of my vain attempts at finding balance–fancy to-do lists, over scheduling, planning, reminder notifications on the smart-phone–am I inadvertently adding to the pile of slippery stones? If I place my feet upon the sure footing of the Word, He will lift me out of the pit and give me a solid place to stand. But this battle–a battle in the mind and a battle for the mind–is a battle we fight sustained by God’s grace and empowered by His love. 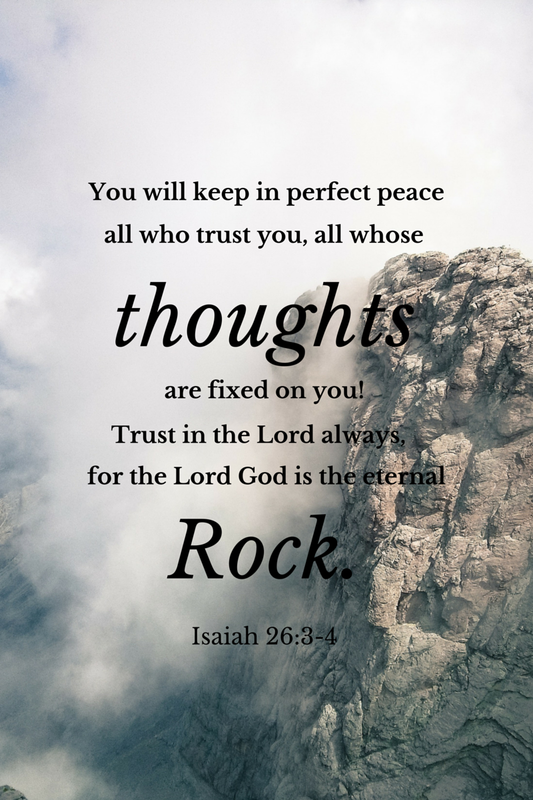 Friend, if it’s not just me, and you want to put balance back into your life, go to the Rock and plant your feet upon Him. Turn to the Word who is your solid foundation and He will make your path straight. Cast your cares upon Him because, truly my friend, He cares for you. And when the prowling lion encircles you, stand firm knowing you are not alone! He [will] put a new song in [your] mouth, a hymn of praise to our God. Many will see and fear the Lord and put their trust in him.